We have been staying at a campground where we have made friends with the whole staff and the few other people staying there. We had a new couple arrived a few days ago, and we wanted to introduce ourselves. She was Egyptian, he was from Germany. OK, OK, before you go all crazy and say what a sexist pig he is, hear me out. He is a recent convert to Islam, and as a rule men and women do not make any physical contact with each other, unless, of course, you are married. It is not to show that men are superior to women, but rather to show RESPECT to women. Well, I am going to be honest here and say I was a little offended when he didn’t shake my hand, even if it was out of respect. 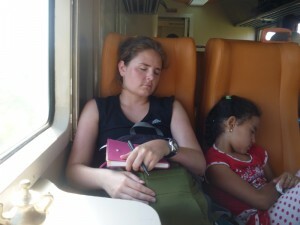 But I am going to have to get used to these things as we travel from country to country and proper greetings will vary. So, what are your thoughts? Please, all comments are welcome. I am curious to hear what you all think of this. All right, so Morocco was a disaster. BUT, before you read this post, please note that Aaron and I bear no ill will towards this beautiful country or the citizens. The fault was ours and ours alone, for we were very unprepared for travel here. Aaron and I were very much looking forward to Morocco, as it would be nothing like we have experienced before. We excitedly talked with a few British fellows we met on the ferry, who were also looking forward to the culture. We arrive safely enough, and take a bus to central Tangier. As we depart the bus, chatting with our British friends we met on the ferry, we are instantly bombarded by different people asking us if we need directions, taxis, weed, etc. Aaron and I politely turned down all inquiries for service, but our British friends did not fair as well with the persistent drug dealer. As we were walking to our hostel 15 minutes later, the same guy was harassing them. We laughed and carried on our way. Now, Aaron and I like to walk about different cities with as little help as possible. We like the challenge of finding our destination on a map, and we find it is a good way to experience the city. As we were walking to our hostel in Tangier, we were probably asked about 20 times if we needed help, and we politely turned them down every time. (For those of you wondering, these people trying to help us ARE looking for monetary gain.) We find our hostel with little trouble and settle in for the night. 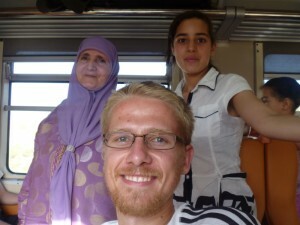 As there is little to see in Tangier, we decide to take a bus to Fez the next day. We go back to the bus station, purchase tickets for the next departure a few hours away, and go to lunch. We return for our departure time a couple hours later. Well, we miss the bus. Why? Because both my iPad and Aaron’s PC set our clocks an hour later than what it actually was in Morocco. So, we have to spend another night in Tangier, and go back to the hostel for another night. I decide to take a nap and read in the hostel while Aaron ventures out to find the Kasbah. Aaron is walking about the city, turning down offers for directions as he goes, until he runs into a man in his 50’s with an agenda. He asks Aaron if he needs help, Aaron politely tells him no, and goes on. The man follows him around for another 5 minutes, giving him advice as he goes. During this time he decides he has done enough to be paid. So, for the next 15 minutes, the man chases Aaron around Tangier demanding to be paid because “this is how it is done in Africa.” Aaron had no small bills or coins with him, and after arguing with him for 20 minutes, Aaron surrenders our Flat Stanley doll we are carrying around for Aaron’s mom’s 3rd grade class. The man is upset at first, but takes it grudgingly and finally leaves Aaron in peace. The next day we arrive at the bus station early to depart for Fez. We are on time and get on the bus. Yay! We are on our way! This is most unpleasant. OK, we endure the bus ride and arrive in Fez. As soon as we are off the bus in Fez, we are bombarded once again by people offering us taxis, tours, etc. We politely turn them down once again, but one man decides I am extremely rude and starts to yell at me about being disrespectful. All I did was say “no thank you” to his taxi service and then ignore him as he proceeded to talk us into buying. We venture out to find our hostel. A nice gentlemen on a moped gives us directions (we didn’t ask, of course), but he didn’t ask for money, only gave us his number in case we wanted a tour guide for the next day. We then find our hostel after being accosted the whole way. We do not get a good night’s sleep at the hostel due to the heat in the room. Usually we would just open the windows, but recently I had been bitten by mosquitoes and I had a terrible reaction, and I didn’t want to endure any more bites at that time. After hardly getting any sleep, and hardly eating any nutritious food the last few days, we wake up and decide to just head back to Spain. I know, I know, this is horrible, but that is really how we felt at the time, and we just couldn’t make ourselves walk around Fez or spend another night in a dirty hostel. 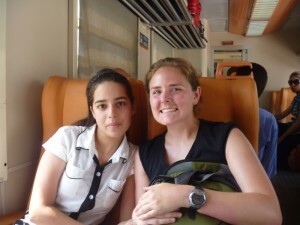 We decide to take the train back to Tangier to catch the ferry. It is only a 4-hour train ride, plus it is roomier. We can handle that. As we make our way north, and make more and more stops, there is no longer room for just the two of us in the 4-seater, and a woman and her teenage daughter sit with us. They pull out a few treats to eat on the train ride, and to our surprise, they offer some to us! I am so touched by the gesture and I am tripping over myself with merci’s, later to find that they speak no French, only Arabic. The next 3 1/2 hours on the train ride are by far my favorite moments in Morocco, and even in our world trip. These people did not speak one word of English, and we could not speak Arabic, but somehow we ended up having a conversation the rest of the train ride. 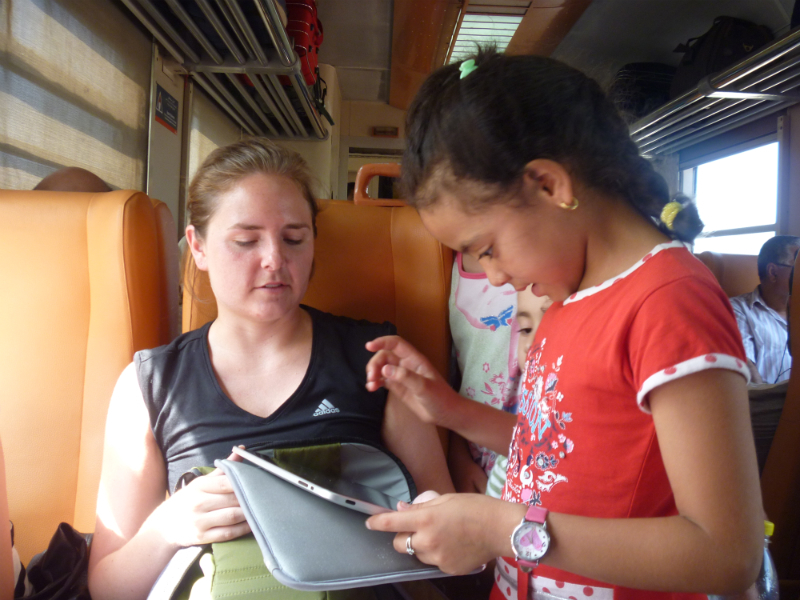 We learned about their family, where they were from, what they were doing in Tangier; we shared photos, took photos; I showed them my iPad, which got the attention of some of the children on the train. They came over to our compartment, and I played a few games with them. The little girl in the red liked me so much, she wanted to sit with me the rest of the train ride. We were really sad to see the train ride end (which is weird, especially since there was no air conditioning), and my new friend (Zulli (sp?) 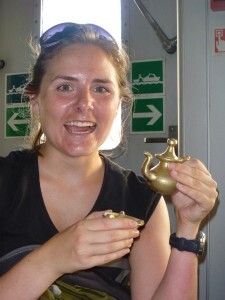 was her name), gave me a small token to remember her by: a mini teapot she had painted. For the first time on our world trip, we really embraced another culture, which is what we are really looking to get out of this. Aaron and I vowed that we would continue this on our journey, and not just get caught up in the tourism. Onwards to the rest of Spain and France! 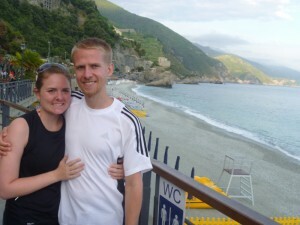 Cinque Terre was highly recommended by not one… not two… but three of our friends that had recently traveled to Italy. 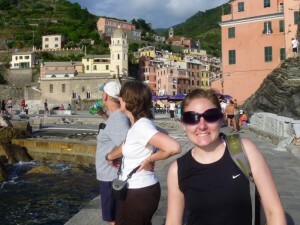 Having never heard of it, I secretly hoped that the majority of the folks in Cinque Terre would be local Italians, and we would have our first chance to really encompass ourselves in the Italian culture. The secret is out on Cinque Terre, and i am not surprised that this national park is overrun with tourists. From the gorgeous views, the access to the clear blue sea water and the scrumptious food, it is the perfect vacation destination, and my favorite part of the world trip thus far. Nestled in the seaside cliffs just outside of La Spezia lies Cinque Terre, and the five villages that make up the park: Riomaggiore, Manarola, Corniglia, Vernazza, and Monterosso. Linking these towns is a 12 kilometer trail that draws international backpackers. We, however, did not hike the trail (much to my disappointment). 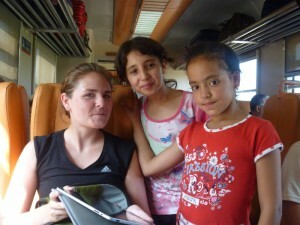 We opted to get to each village by train and explore what each of them had to offer. 1.) 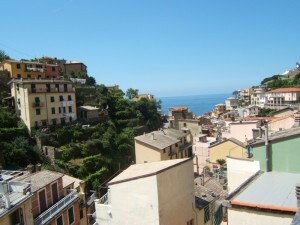 Manarola- This is the second closest village to La Spezia. It seemed to be the least crowded and it had the best swimming lagoon of all five villages! I would recommend Manarola as the village to spend most of your time if you are planning to visit. 2.) Riomaggiore – This is the village closest to La Spezia and the one we stayed in. there is a beach, but it is not ideal for laying out and swimming because the ocean is rough and the beach is made up of large stones rather than sand. There are plenty of amazing restaurants, and since our apartment was so high up the cliff (seven flights of stairs to get to it – wow! 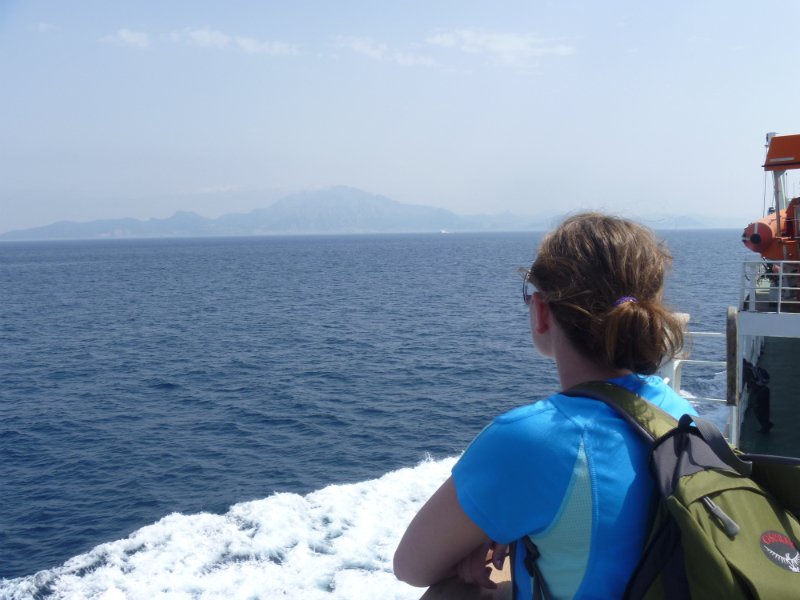 ), we had amazing views looking over the town and the ocean. Also, it seemed to be the second least crowded, and there were plenty of locals in the streets. 3.) Monterosso – this is the farthest village from La Spezia and the most touristy. It has the largest beach of all the towns, and a cute boardwalk with clothing shops and gelato stands. We spent a few hours on the beach here and we ate at an amazing restaurant off the boardwalk. There is also a great view of the four other villages, especially at night. 4.) 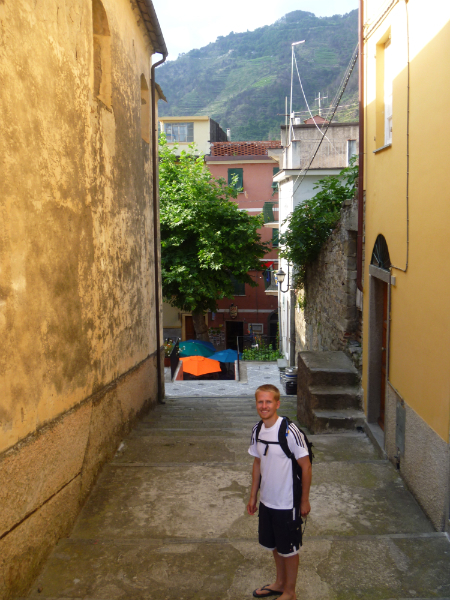 Corniglia – This had the least amount of tourists by far of all the villages, probably due to the fact that there is no beach access and you have to climb over 400 stairs to get there from the train station. It is picturesque, as it is set high in the cliffs among the vineyards. I’d say it is definitely worth the climb, but definitely don’t expect to spend more than 2 hours there at most. 5.) Vernazza – The last, and my least favorite village is the second farthest city from La Spezia. There is an extremely small beach, and for some reason (at least when we were there) this village draws the most american teenagers i have seen on this trip. I have no idea where they came from, but the shrieks and screams as they ran up and down the village became quite annoying. So there is Cinque Terre. For sure don’t miss it, just like everyone else from America.